GUSTAV STICKLEY (1858-1942) so synthesized, romanticized and popularized the Arts & Crafts style of architecture during the first two decades of the last century that today the style is known generically as "Craftsman." However, only a house originating from plans published by Stickley through his magazine The Craftsman can be a true Craftsman Home. He published descriptions and drawings of homes in this magazine beginning in 1901. In the January 1904 issue, he featured the first official Craftsman Home and announced that henceforth the magazine would feature at least one house a month, and subscribers could send away for a set of plans for one house from the series per year, free of charge. These Craftsman plans offered the average American family a house that was a home, based on the bedrock virtues of beauty, simplicity, utility and organic harmony. 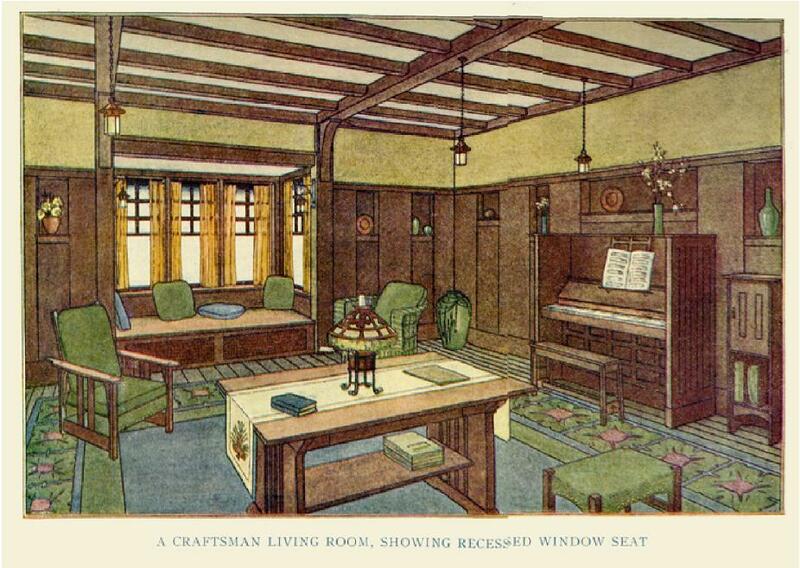 Stickley believed that the "nesting instinct" was "the most deep seated impulse" of humankind. He wrote in the magazine: “The word that is best loved in the language of every nation is home, for when a man's home is born out of his heart and developed through his labor and perfected through his sense of beauty, it is the very cornerstone of his life.” He intended in his home designs "to substitute the luxury of taste for the luxury of costliness; to teach that beauty does not imply elaboration or ornament; to employ only those forms and materials which make for simplicity, individuality and dignity of effect." Today we are left with an unexplored legacy. Stickley's furniture has been researched and the findings presented in many books and articles, but his architectural contributions have yet to be fully examined. Perhaps this is because collectors whose passion is furnishings have yet to try collecting the ultimate Arts & Crafts piece—the piece everything was designed to fit into—a Craftsman Home. How do we recognize a Craftsman Home? •Like a piece of Stickley furniture, a Craftsman Home has refinement of design and quality of construction and finish.
. •It is often site related and placed to advantage using the site.
. •The house is built with materials found on the site, and/or natural materials native to the region.
. •As with Stickley's furniture, the house designs rely on exposed structural elements for decorative details. The variety of natural materials provide textures for light to play on.
. •Voids—in the form of recessed porches and entrance ways—and terraces and pergolas, create visual interest.
. •Interiors emphasize form and function. Space is conservatively and creatively used for living, with design elements utilizing wood and built-in spaces such as inglenooks, benches and cabinets.
. •Light fixtures and hardware relate as design elements. This philosophy and these decorative details were expensive to execute. Consequently, although the homes were idealistically conceived for the masses, they were built primarily by the middle class. They used Stickley's Craftsman Home plans, and many modified them to suit their tastes and requirements. These homes were not “kit” houses like those sold by Sears, Roebuck and Co. and Aladdin Homes, but were always built by local builders chosen by the owner, from these plans sent through the mail by Stickley’s firm. How many of these houses were actually built? Stickley designed at least 242 homes and published over 221 plans. He expended great effort promoting them, publishing a number of promotional pamphlets and at least two books, Craftsman Homes and More Craftsman Homes. [These books are available in inexpensive, quality reprints from Dover Publications.] While some of the house designs were featured in these promotional books, the only existing source for ALL the plans is Stickley’s Craftsman Homes, published by Gibbs-Smith. We do not know how many were actually built, but believe that a great many were built across the country. We speculate that the educated middle class built them and that they will be found mostly in areas around cities where the first suburban expansion took place. In larger cities they will be found in areas serviced at the turn-of-the century by commuter railroads and street cars. They will also be found in towns with universities or art communities. We don't yet know for sure who designed the Craftsman houses. There are many different drawing styles in the magazine’s renderings, indicating different draftsmen at work. No staff architects are listed on Stickley's payroll records, but a number of draftsmen are noted as being in the architectural department, and a few architects appear to have been paid consultants from time-to-time. Of course, there may have been a number of unlicensed architects among those draftsmen. Nevertheless, considering Stickley's intense interest in the project, it is safe to say that he had major responsibility for the designs. Probably he had professional help along the way, and perhaps the designs were seen by a consultant at some point. Some few designs are out of character and may be the work of other architects. Before he established his new business he traveled to Europe and around the U.S., and he surely was aware of the various architectural styles of Josef Hoffmann, C. F. A. Voysey and M. H. Baillie-Scott, as well as published Will Bradley interiors and the houses of the Prairie School movement, led by Frank Lloyd Wright. Also, Stickley appears to have been a "quick read" and may have learned a great deal from his brief associations with architects Henry Wilkinson, E. G. W. Dietrich and Harvey Ellis. From its beginning The Craftsman published house plans. Interior room designs began appearing in 1901, perhaps to display the furniture in the proper setting. Stickley must have known that it did not look good in the Victorian interiors of the time. The first house article was called "The Planning of a Home" and featured a design by architect Henry Wilhelm Wilkinson. In the Experimental period The Craftsman printed suggestions for architectural details, although not always complete house plans. The prototypical Craftsman House appeared, a suburban house "by the United Crafts," in an article by editor Irene Sargent. The design of the interior resembles the furniture—massive, plain and simple. In early 1903, several houses designed by architect E. G. W. Dietrich appeared and the term "Craftsman House" was first used. All interiors, of course, showed Craftsman furniture. The relationship was being established: the furniture and the houses go together into a new living environment. The furniture was only part of a much broader picture—a new life style. During 1903, architect/designer/artist Harvey Ellis came to work for Stickley and this brief relationship (Ellis died in 1904) strongly influenced Stickley for the rest of his career. Ellis designed a line of lighter, more art nouveau-looking furniture, and he wrote and drew extensively in The Craftsman. A series of very interesting conceptual houses by Ellis were published during 1903, including a Craftsman Home (a suburban house), an Adirondack camp, an urban town house and even a summer chapel and a farm house. These designs were unlike anything previously published in The Craftsman. After Ellis' death the overt influences gradually disappeared, as Stickley reverted to plainer and more rectilinear designs. But the use of the curve and other Ellis signatures continued to show up in the furniture and houses. After 1904, the houses were published for the life of the magazine, except for two periods: The first break ended the Detailed Home period and was from June 1907 to December 1908, when Stickley was involved in the purchase of Craftsman Farms and the setting up of a home building company. During that time articles on various cabins for Craftsman Farms appeared, as well as the Farms' "Log House," which was originally designed as a "Club House." In January 1909, the house designs resumed. This was the beginning of the Mature period, 1909-1915. These houses were more unified visually—their style is consistent. Two homes were offered each month and only an exterior rendering and one other drawing—an interior view or an exterior detail such as a porch or sleeping porch—as well as floor plans were shown for each house. The interior was often designed around a fireplace inglenook. Stickley believed that the fireplace could be the center of indoor family activity—the recreation room of today! Midway thorough this time a slug appeared under the drawings indicating Stickley as the “architect.” But as Stickley's economic decline began, the articles became shorter and the interior drawings were dropped. Again, without editorial comment, the houses were dropped in June 1915, for one year. They resumed in June 1916, one month after editor Mary Fanton Roberts' article about Stickley's bankruptcy and the introduction of his Chromewald furniture line. This six-month period featured the last set of Craftsman Homes. In the accompanying article, Stickley said that he really felt that he had exhausted the subject but that reader demand was forcing him to renew the project. By this time Stickley was pretty much out of the picture and whatever influence he had on these houses was indirect; the Architectural Department had worked under his supervision and knew how he thought. His compass mark and name were gone from under the house drawings and, instead, "There are no 'Craftsman Houses' except those which appear in this magazine" appeared. These houses were probably designed by George Fowler, who along with Roberts and the rest of the staff, founded The Touchstone, when The Craftsman finally ceased publication in December 1916. The reader demand must have been high, because The Touchstone continued to offer "Touchstone Houses" designed by Fowler.